The Turitea Wind Farm is situated at Turitea, near Palmerston North, and enjoys world-class wind resources. Its 33 Vestas V112-3.45 MW turbines will be delivered in 3.6 MW Power Optimised Mode and have a hub height of 69 metres, designed specifically for the site, which will maximise annual energy production and deliver one of the world’s highest generation outputs per turbine. “New Zealand has outstanding wind resources, and we look forward to capturing some of this potential in the Turitea wind farm project”, said Mercury Chief Executive Fraser Whineray. “Mercury is 100 percent committed to renewable energy, and we share a vision of energy freedom with our customers, their communities and our country. We are proud to add another renewable resource to our portfolio through a contract that leverages Vestas’ global experience and wind turbine technology”. 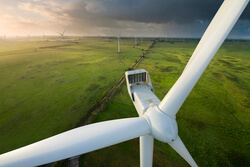 “We are proud that Mercury has selected Vestas as its supplier for its first wind project, and we look forward to continuing this relationship as Mercury expands its portfolio,” said Peter Cowling, Head of Vestas Australia and New Zealand. “With our rich wind asset management experience, strong Palmerston North presence and the latest in turbine technology, we will capture the full potential of these wind resources, driving down the cost of energy and delivering commercial value for our customer”. Upon completion, Vestas will commence a 25-year Active Output Management 5000 (AOM 5000) service agreement, designed to maximise energy production for the lifetime of the project. With a yield-based availability guarantee covering both turbines and balance of plant assets, Vestas will provide Mercury with long-term business case certainty. Commissioning of operations at Turitea Wind Farm is scheduled to commence in the second half of 2020.